As a certified “old,” it boggles our mind why anyone wouldn’t want to add regularly scheduled trips to Costco to their shopping itinerary. What’s not to love: The free samples in every aisle? The vast quantities of necessary products like toilet paper and Nutella? The delicious hot dogs and giant pieces of pizza in the snack bar? The reasonably priced clothing that possibly could be considered fashionable if you squint hard enough? But all that retail splendor is not enough for the young people, who would prefer to order their toilet paper and Nutella online, thanks. 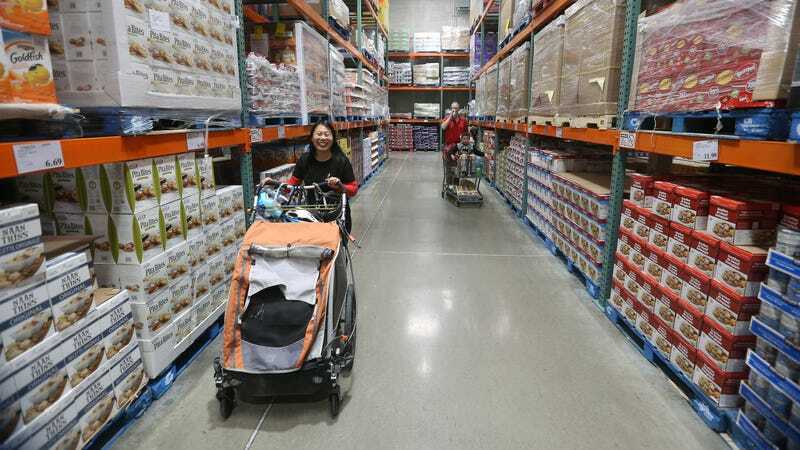 A Washington Post article titled “Will millennials kill Costco?” notes that “as more of Americans’ buying shifts online, some retail analysts say warehouse clubs may largely be left behind.” Apparently, more (younger) people opt for ordering from services like Boxed and Amazon Prime over leaving their homes. The Costco demographic is not a surprise to any box-store member that receives the Costco Connection magazine, with covers that usually feature Boomer- and Gen X-friendly celeb heroes like hockey legend Wayne Gretzky and astronaut Scott Kelly over anyone for the under-thirties. Also, practicality comes into play: Twentysomethings are more likely to live in apartments or condos than houses with room for that giant pack of 20 rolls of paper towels. And apparently, they are more inclined to spend their weekends doing things other than hanging out trolling for samples at the big-box store. That retail shift has taken its toll, as “Warehouse clubs and supercenters cut an average of 2,500 jobs each month in 2017, reversing a longtime trend of steady growth, according to a Washington Post analysis of Labor Department data.” Walmart also recently announced the closing of 63 Sam’s Club stores. After all, as Malpuru points out, “Retail is a zero-sum game: As consumers shop more at one company, they’ll shop less at another.” Look, millennials, just try the pizza and the affordable leggings before logging on to Amazon Prime again, okay?